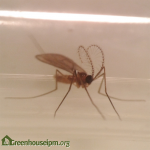 Aphidoletes aphidimyza is a predatory midge whose larvae are voracious predators of all aphid species, capable of handling heavy pest pressure. The adults have delicate legs and wings, so special care must be taken during release so as not to damage them. 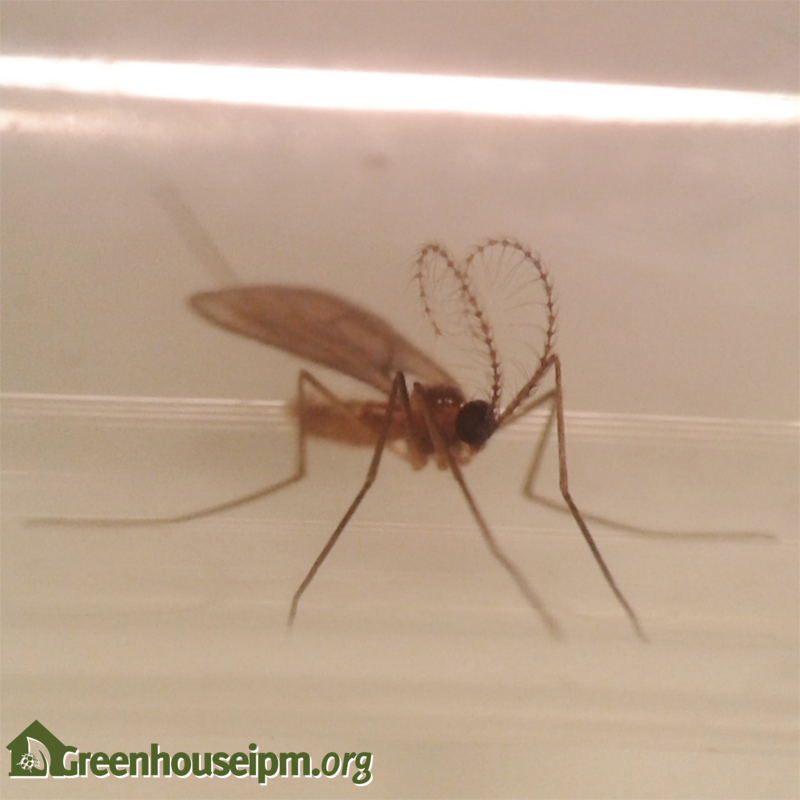 Adult Aphidoletes are small (2-3mm long) flies that resemble mosquitoes, with long, delicate legs and antennae. The larvae are legless, resembling maggots which grow up to 3mm in length, and have a distinctive orange colour. 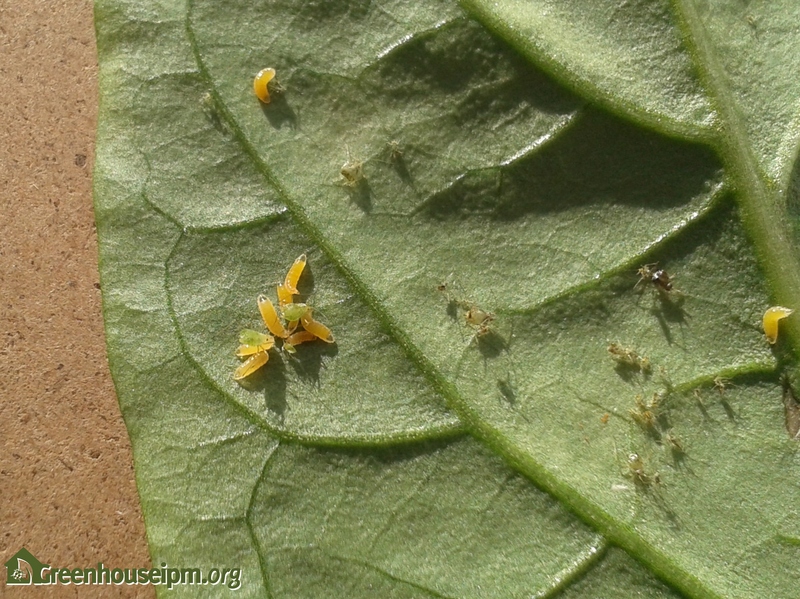 Adult female Aphidoletes lay their eggs on aphid-infested leaves. Each female can lay up to 300 eggs in her 1-2 week life span. Eggs hatch after 2-3 days and begin feeding on aphids by injecting the aphids with a toxin that paralyzes them, and sucking out the body fluids, killing the aphid. When aphid densities are high, Aphidoletes larvae will kill more than they need to consume, killing up to 50 aphids per day during their larval stage. Larval development takes approximately 2 weeks, after which they will drop to the soil to pupate. During spring and summer, new adults will emerge in 2-3 weeks. During the fall and winter months, under low light, and/or short days, they may enter diapause during the pupal stage. This makes it difficult for Aphidoletes populations to establish in the greenhouse during fall and winter, particularly if supplemental lighting is not used. However, this does not affect the number of eggs laid by adult females, or the predatory ability of the first generation of larvae. They are therefore still a useful biocontrol agent in fall and winter months, particularly if there are larger populations of aphids that need to be managed. In a long term crop, any Aphidoletes that entered diapause in the fall and winter may begin to emerge as adults again in the spring. Adult Aphidoletes have a good dispersal ability and are efficient at locating aphid hot spots. Aphidoletes will enter diapause under low light, and short day lengths and may have difficulty establishing in the fall, and winter. Larvae don’t enter diapause until they reach their pupal stage, making them effective predators during their first generation.